Today I’ll be teaching you how to make a list of all Firefox’s plugins, addons, extensions and themes with AND without using any third party applications! This will basically show you troubleshooting information about Firefox including the current version of your browser, The modified preferences and also a list of the addons you have! Just hold down Ctrl key and quickly select all cells under the “Name” column in the addons table, Then copy them to wherever you want! This will show you a list of all the installed plugins you have along with some information about them. 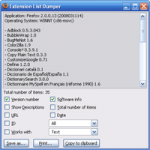 This extension adds a button (“Dump list”) to the Addons window. When this button is clicked, a new window pops up with the list of installed addons extensions, themes and plugins. It also shows the current version of Firefox and the operating system. Previous post: How to decode encoded themes / templates? Next post: HOW TO: Monitor your computer’s hardware temperature? !